Trigger points in the body, commonly known as “muscle knots” consist of tense and tight areas of muscle tissue that is frequently the source of pain. The source of the pain however, may actually originate in other parts of the body. A trigger point or ‘knot’ in the back for example, may cause debilitating pain in the neck area. Qualified Spa Bliss massage therapists are trained and experienced to identify the source of muscle pain and administer treatments to provide lasting relief from chronic pain for our Charlotte, NC clients. Trigger points on the body are classified as either active or latent. Active points are the source of muscular pain. Qualified Spa Bliss practitioners apply effective treatment to release pain and physical tension at its source through massage treatment in an alternate area. 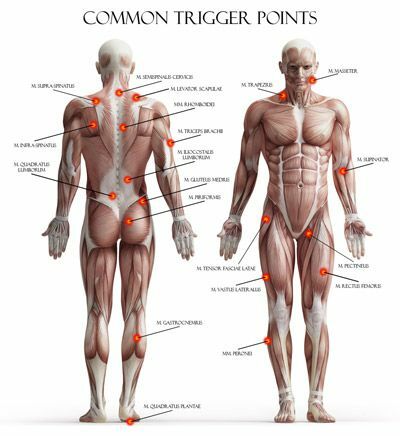 Latent trigger points, on the other hand, do not always correspond to pain in another part of the body and may cause discomfort only when constricted. Frequently the cause of stiff joints and declining mobility as we age, latent trigger points are also associated with chronic pain syndromes that include fibromyalgia. Releasing trigger points increases muscle strength and flexibility and improves range of motion. Spa Bliss massage therapists are trained and experienced to identify affected areas and provide lasting relief with professional massage therapy treatments. Many clients experience significant relief following one or two trigger point therapy treatments. The frequency of treatment varies and depends on your condition. We invite the people of Charlotte, NC to contact our licensed specialists to find out more about treatment options.